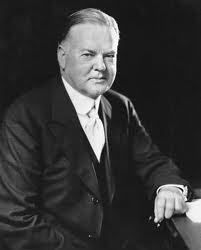 Herbert Clark Hoover was the 31st President of the United States (1929-1933). Hoover was a professional mining engineer and author. As the United States Secretary of Commerce in the 1920s under Presidents Warren G. Harding and Calvin Coolidge, he promoted government intervention under the rubric "economic modernization." In the presidential election of 1928, Hoover easily won the Republican nomination, despite having no previous elected office experience. To date, Hoover is the last cabinet secretary to be directly elected President of the United States, as well as one of only two Presidents (along with William Howard Taft) to have been elected President without electoral experience or high military rank. The nation was prosperous and optimistic at the time, leading to a landslide victory for Hoover over Democrat Al Smith.